When she was a baby she was stolen by an elemental. An elemental is neither spirit nor man, more than a fairy, but less than an angel – yet capable of evil. We brought our daughter to the beach last summer. We placed her on a blanket under the glorious sun and watched her skin turn golden brown. Her complexion was redolent of mangoes and papayas and the soft sweetness of young coconuts newly taken from the tree. I remembered who I was as I watched my daughter sleeping on her blanket. I remembered a story from my past, from island times. I had started to forget who I was, living quickly on the East Coast. And then I had a daughter, whose almond eyes and golden skin belied her abundance of European ancestry. Her father is a Yankee, Boston born and bred. All of a sudden I cannot forget. I am a child again, listening to my grandmother tell a story of her childhood on the island of Marinduque in the Philippines. When she was a baby she was stolen by an elemental. An elemental is neither spirit nor man, more than a fairy, but less than an angel – yet capable of evil. She was sleeping in her crib on the veranda. Her baby bed, carved from the finest mahogany was covered with a mosquito net which hung over her crib like a shroud. Her parents had looked down and seen her sleeping peacefully on her side, hands curled under little fat cheek, soft breath rising and falling. They stopped and bowed their heads over the crib as the Angelus bells called from the village church. The bells carried their solemn peals across the rice fields, through the towering coconut trees heavy with fruit. The household stopped, master and servant and child. They bowed their heads and prayed, “The angel of the Lord declared unto Mary….” After the Angelus, they turned to one another and said, “Good evening.” The fragrances of the evening time mingled. Succulence from the kitchen meshed with the heady perfume of jasmine. Evening had fallen in Marinduque. The temperamental elementals, jealous of human happiness needed to be placated with gifts of food. The nursemaid went to touch the sleeping baby. She parted the folds of the mosquito net and screamed. The baby was gone! How could that be? Not five minutes ago, the family was gathered near the crib, not five minutes ago, the mother glanced in thanksgiving for this time of peace, this time of a blessing of a healthy baby sleeping in her crib. In minutes a search party was formed. From the recesses of the fields, Tomas was summoned. Tomas was neither Christian nor pagan. He knew both spirits of heaven and earth. The temperamental elementals, jealous of human happiness needed to be placated with gifts of food. Their permission needed to be asked for the use of the fields. If a tree was cut down which housed an elemental, oftentimes the woodsman would be asked to pay with blood. Marinduque was an island that belonged to spirits not yet willing to recognize the power of the divine. They were quieted by frequent references to the Holy Name. They had no interest in inhabiting a road named after Saint Sebastian. Tomas knew how to speak to these spirit-creatures. He moved into a trance. His wrinkled face turned ashen and he picked up a torch and stepped into the fields. Tomas, holding aloft a crucifix and a torch, led the ghostly procession as it shimmered its way through the fields—a rosary of fire illuminating brown faces. The mother of the child wept while reading the Litany of the Virgin as the procession shouted the responses. Tomas stopped suddenly at the edge of the grove. The mouth of a cave gaped in the darkness. The mother begged him not to go in. “The child is in there,” he said. They moved in furtively, silently now, walking softly with the torchlight dancing on the ceiling. They beheld a large chamber, some thirty feet in height, with various smaller chambers beckoning in the distance. Tomas brought his torch up to a large, dark shape. The mother gasped. In the center of the cave was a bell from the village church. “Hurry,” he said, as five strong men picked up the edges of the bell and lifted it carefully, and carried it gently to the side. She was sleeping under the bell. Her little hands curled up under her fat cheek. Her hair was curled loosely against her head. In deep slumber her breath rose and fell. The mother knelt and swept the sleeping baby up. The child’s father guided her steps out of the cave and the torch lit procession went back across the fields and stopped in front of the village church. Padre Luis Garcia de Montoya, Dominican friar appeared at the window in his nightshirt. His thick head of white hair caught the torchlight. “What has happened?” he shouted down from the window. “The child must be baptized!” said the father. “Can it not wait until morning?” he said, sleepily, unaccustomed to being told what to do. “If you cannot christen her tonight, we will have to sleep in the church, “said the father of the child. “Ay que barbaridad!” said the weary priest. The thought of breakfast lightened his load. He shook his head at the endless superstition of the island and he lumbered down the stairs and into the church. He waited at the altar while his servant flung the church doors open and the people poured in. The mother and the father of the child pressed close to her as she was baptized. Maria de los Mercedes Gonzales y Madlangbayan. Padre Luis intoned the ancient prayers, and finished with a special invocation . “Protect us from the powers of darkness,” he said. At the end of the ceremony, and the bells of the village church welcomed the morning. I first heard this story in 1976, when I was on a long bus trip from Manila to Batac, Ilocos Norte to sing with the UP Concert Chorus for the birthday of President Marcos’ sister, Elizabeth. As young people do on a long trip, we told stories. The mother of my friend who carried this story was from Marinduque, as was my grandmother. I took the core of the story -the baby kidnapped by supernatural forces, the procession, the bell, the baptism – and wrote a story around it, using family names. I knew very little about the island then. Recently I learned about Marinduque’s mysterious caves. From the South Coast Today: Kathleen J. Burkhalter, age 59, of New Bedford, passed away surrounded by her loving family on April 28, 2016 at St. Luke’s Hospital. She was the beloved wife of David Bell with whom she shared 31 years of marriage. 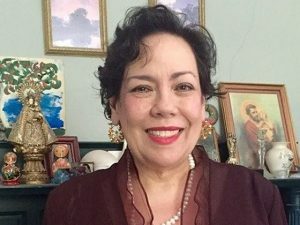 Born in Augusta, Georgia and raised in Baguio, Philippines, Kathleen lived in New Bedford for the past 19 years and previously lived in San Diego, CA. She was the daughter of the late Patricia J. and John Felton Burkhalter. Kathleen received her undergraduate and graduate degrees from Harvard University. She earned a Master’s Degree in Journalism. She worked as a writer and was the publisher of the Cheerful Cherub and Firefly Press. Her most cherished vocation, however, was being a mother.